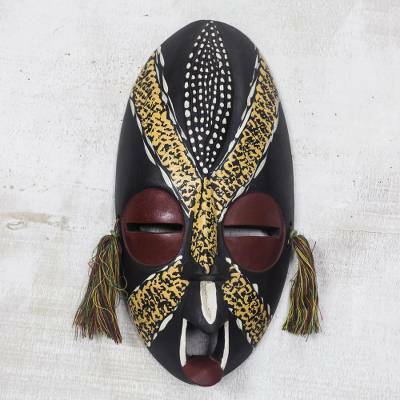 Handcrafted African Sese Wood Mask from Ghana, "Nyame Bekyere"
Hand-carved from sese wood, this oval African mask is designed by Ghanaian artisan Enoch Adjei. He paints it black with a yellow X across the face, accentuated by white dots at the forehead and a red color at the eyes. Earrings of recycled glass and cotton complete this mask. Adjei names it Nyame Bekyere, meaning "God will provide" in Akan. Enoch Adjei has received a $100 microcredit loan with 0% interest. "I saw wood in its natural state and how the carvers and designers could transform this wood into something unique. I developed a love for this craft." "Enoch Adjei is my name. I was born on December 27, 1982, in the Eastern region of Ghana. I am a quiet, polite and hardworking person, a wood-carver and designer. "I grew up in a community of carvers and my guardians are also carvers. During weekends and on vacations, I tried my hand at sandpapering carved items. It was a wonderful experience for me. I saw wood in its natural state and how the carvers and designers could transform this wood into something unique. I developed a love for this craft. So, after my basic education, I informed my guardians that I wanted to pursue carving as my career. "Ernestina Oppong Asante — a Novica-feaured artisan who is my guardian — was happy about my decision. She paid special attention in training me, as she knew I could be make a living with this art. "Because of my passion for carving, it was easy to learn very fast. Starting on my own was not so difficult. I had already observed carving over a long period of time at home and at my guardian's workshop. Their mentoring helped me avoid many mistakes I would otherwise have made. I learned about quality observation on finished masks and sculptures. I sold what I created at the workshop. This helps me to be independent even though I work in the same workshop. Continuous practice has helped me master the skill. I assist new people who come to learn with the basic things they need to know about carving. It is a delight to train someone. "I use sese, cedar, ebony and tweneboa woods and aluminum plate for my carvings. They are not difficult materials to work with. "I love animals and love to carve them."